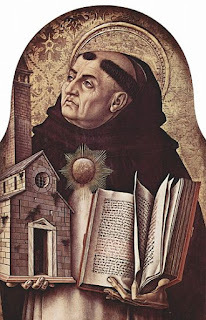 In part 1 of this essay I introduced the three constituent elements of beauty according to Thomas Aquinas: integritas, consonantia, and claritas. And we examined the first element, integritas, or integrity, as it relates to electronic organs. Do Thomas's two other aspects of beauty have something to tell us about the nature of electronic organs? Consonantia - consonance or proportion. Proportionality is a common problem with electronic organs, and I think a big strike against many of them. One of the reasons that a parish might be attracted to an electronic organ is because of their ability to acquire a "larger" instrument than the realities of a pipe organ would allow. The perceived advantage of an electronic instrument is that it has greater versatility than a similarly priced pipe organ. There would be more variety of tone color, perhaps even an additional manual, and more "toys" for the organist. But in reality, the tonal scheme is too "big" for the space it is trying to fill. Too often we see these extra elements in the electronic organ blown way out of proportion. The gimmicks and flexibility allow it to sound like an English "cathedral" organ one minute, and a North-German-style instrument in a historic temperament the next. This is just disingenuous. Just because you've decided against a traditional pipe organ doesn't mean that the congregation should be sonically disoriented by hearing many hundreds of stops, and several different style organs in the same space. This is a bridge too far, as is the MIDI harpsichord that comes standard. The increasing technicization of the electronic organ makes this kind of variety a selling point, but it destroys the consonantia of the instrument. Is it possible to build a real pipe organ out of proportion with its space? Absolutely! But it's much easier to do this with an electronic installation. Claritas - "the power of a thing to reveal itself to the mind"
This is a little trickier, but I think it affords us an opportunity to speak of an element of organ design that we have neglected in this conversation: the organ's visual design. Pipe organs are very physical installations. The placement of pipes in some kind of chamber in relationship to the placement of the choir (or other instruments) and to the rest of the worship space (or hall) is all navigated with great care. The resulting layout also has implications for how the organ looks from the "outside". Pipe organs, with few exceptions, have their pipes on display to some degree. The Werkprinzip of North German organ design meant that the claritas of an instrument was fully visual as well as auditory: the divisions of the organ could be fairly easily seen and understood. An Americanized version of the Werkprinzip occurred with many 1950s and 1960s organs by Holtkamp, and I have a real soft spot for these instruments. Though others may find them too angular and passé, I find them distinctively beautiful. They make my heart skip a beat. Two that I would single out for particular praise are the organ at Setnor Auditorium, Crouse College, Syracuse Univeristy and Battell Chapel, Yale Univeristy. This is an important element in this discussion because organs are truly inspiring instruments. And, after hearing fine organ music, one of the first ways that young organists are inspired to study the instrument is by seeing one. With the electronic organ, however, there are no pipes of any type to see. And if there are pipes on display it just furthers instrument's inherent dishonesty. There is no claritas in the electronic organ. The emperor has no clothes, and he is not beautiful. For too long we have let the electronic organ manufacturers set the tone and substance of this conversation ("It's less expensive!" "It sounds just as good!" "Not even organists can tell the difference!" "The technology will amaze you!"). The substance of the conversation really revolves around a sales pitch rather than theological considerations. But I think there has to be something more to this, especially when it comes to acquiring an instrument for a church. What about theology? What is our theology of art, architecture, and beauty in the church? Are electronic organs truly beautiful? Lately I've really been enjoying a podcast called The Liturgy Guys, a podcast on liturgy from a Roman Catholic perspective from the Liturgical Institute in Mundelein, Illinois. I went back to re-listen to Episode 25: "Beauty and the Feast, Part 1" because I thought it might be able to inform our thinking on electronic organs. This episode offers an overview of medieval theologian Thomas Aquinas's theology of beauty. Beauty, according to Aquinas, has three constituent parts: integritas, consonantia, and claritas. A beautiful thing reveals what it is, and a thing can't reveal what it is if it doesn't have all the things it's supposed to have. I mean, imagine: it's the first time you've ever seen a car and there are no wheels on it. You haven't seen the fullness of "car" because wheels are a component element of "car". …Anything without all of its stuff, all of its parts, is not revealing itself to you. That's what Thomas calls integritas or "integrity" – wholeness. …A thing has to have everything it has to have in order to reveal what it is. So, according to the Thomasian definition of integritas, are electronic organs beautiful? Do they have integritas? An electronic organ cannot reveal what it is because it is pretending to be something that it's not. In my essay about electronic organs last week I chose the word integrity to draw attention to what I see as the fundamental problem with these instruments; according to Aquinas's definition of integritas electronic organs are not whole. 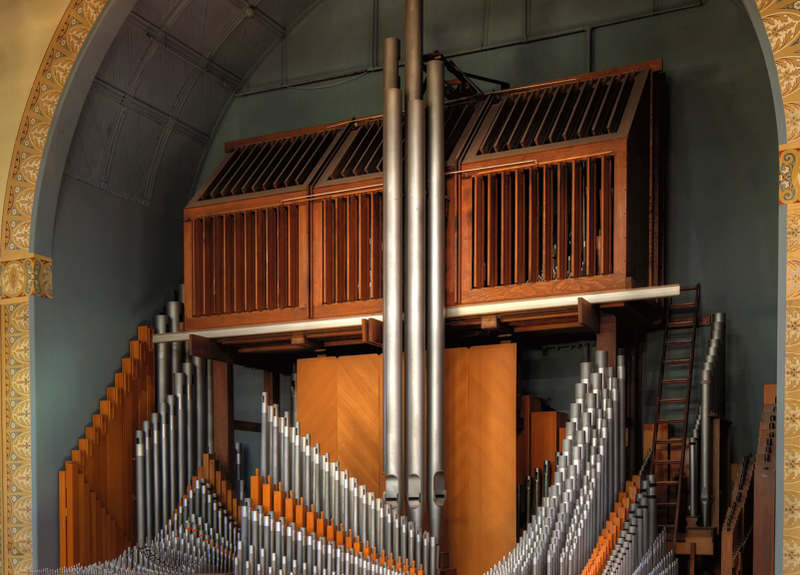 Even though electronic organs attempt to mimic the sounds of pipes, they lack pipes themselves. An electronic organ doesn't "have all the things it's supposed to have". It doesn't have all of its parts. It cannot reveal what it is because it is pretending to be something that it's not. Now, before you and Thomas Aquinas accuse me of being a Luddite, or aloof, or arrogant, or impractical (all accusations I probably deserve), let's acknowledge the reality that many churches already own and use electronic instruments in their worship. And others are considering purchasing them. And furthermore, let me state unequivocally that this line of amateur theological inquiry is not meant to be a personal attack on those who preside over electronic organs. The instrument doesn't make the musician. I believe we are all – together – seeking to "perfect the praises offered by your people on earth," as the famous prayer on page 819 of the BCP puts it. God can be praised with whatever we have at hand. But in spite of this, I think it is high time to take a bold, principled stand in defense of beauty in the liturgy, including the preference for real pipe organs. "What if that's what God wants from us in this generation: to choose what is ugly and real over what is beautiful and fake? (I don't believe that's actually the choice, most of the time; I trust the ingenuity and wisdom of the church musicians in my life to create beauty from whatever God gives us.)" Ultimately Mary comes down on the side of the real – but could something be "ugly and real"? My mind flashes once again to that archetypal 1999 film of the Information Age, The Matrix. After taking the red pill and seeing the "real world", the cinematography and the costumes are drab, dull, gray, dirty. But the point here is that the "real world" is devoid of illusion. The illusion provided by "the Matrix" is certainly attractive, but part of its purpose is to mask the illusion itself (it is the "beautiful and fake"). And the arrival into that "real world" with all of its "realness" is something to be celebrated. From the Liturgy Guys podcast again: "…Properly speaking, there's no such thing as ugly. There's beautiful and there's less beautiful. The only ugly thing is non-being." When we choose the fantasy provided by the electronic organ, we choose just that: a fantasy. An illusion. The electronic organ, then, cannot be ugly. We are talking about it, and it is, therefore it must be. And we have to admit that digital technology hooked up to loudspeakers does still deal with the laws of physics of this created sphere. But given that the electronic organ does not have integritas in the Thomasian sense it is lacking in beauty. It is something less beautiful. When we choose the real, however, we choose the beautiful. Add to the ever-growing list of cathedrals and college chapels regularly webcasting services that place of particular importance to the Anglican Communion: Canterbury Cathedral. Keep an eye (ear?) on this new effort, which appears to be just beginning. In the two services posted so far, hymns are included, but choral music is not. Recordings of some of our services are being made available via the Cathedral’s Soundcloud page. We hope this will enable those unable to join us in person to enjoy a little of the worship which is so much part of the rhythm of daily life in the Cathedral. It is hoped to soon expand the services we offer to include more of the wonderful choral work of the Cathedral Choir. There are now quite a number of places in which one can hear regular choral services in the Anglican tradition. Since writing this essay of initial reflections I have returned to the topic for Aquinas, Thomas - on electronic organs, part 1 and part 2. All articles on this topic at the blog at Sinden.org can henceforth be found under the label: electronic organs. I'll say it again: I might be wrong. But the recent publication of an electronic organ on the cover of The American Organist (the journal of the American Guild of Organists) has me thinking about the electronic organ. And before I go any further I want to address those who play electronic organs directly: this is not about you. And I don't question your character one way or the other. This is not about me, either. This conversation is bigger than all of us. It began before we were born, and it will continue after we're dead. This is about technological innovation, the economics of music and religion, wind, beauty, and integrity. What I'm trying to do is zoom out for a moment to get the big picture. I want to figure out what led us to the point in May 2017 when our professional organization would seemingly validate a fully-electronic organ by allowing it on its cover of its journal. The organ has been on the forefront of the technological advancement of humankind. And every step of the way surely there was someone crying "what are you doing!? organs aren't supposed to work that way!" in the mid-1400s, when someone figured out how to add "stops" to an organ so that the full blockwerk wouldn't all sound at once. the first reed stop was invented in…what, the 1500s? the first swell box was built in 1712.
the first electro-pneumatic action was built. So, is the electronic organ (now really the "digital organ" or the "software organ") the way of the future? Is it simply the next technological advancement in a logical line of progress? It's interesting to note the chasm between the academic study of organ performance and the practical realities organists will encounter in the real world. No reputable academic institution would suggest serious performance on an electronic substitute; they require lessons and recitals to be held on real instruments with pipes. Churches, on the other hand, are often happy to acquire electronic substitutes for reasons of 1) low initial cost, 2) space limitations, and 3) and ease of maintenance. 2) Space limitations: many organ builders are familiar with this challenge and know how to meet it. 3) Ease of maintenance: organs typically need to be tuned twice a year. Well-built organs I have known are virtually maintenance free outside of this. Others just need a capable technician when something goes wrong, just like your car does. What is lost when a church decides to go the route of an electronic device rather than an instrument with pipes? Many things, including 1) wind, 2) beauty, and 3) integrity. 1) Wind: Why does should it matter if an organ works with pressurized air rather than electrical impulses? Because the Church uses the building blocks of creation in her worship: fire, water, stone, and the fruit of the earth itself. We don't use electric candles, we use real candles that we can light. In terms of organ building, we take wood and metal, combine them just right, and get wind. Wind is a particularly special part of the Christian Faith. Just pay close attention the next time you're at the Easter Vigil. It was the wind that moved over creation in the beginning. It was wind that passed over the earth when God remembered Noah in the ark. It was wind that divided the Red Sea so that the Israelites could pass through. When Ezekiel prophesies to the dry bones he says, "Come from the four winds, O breath, and breathe upon these slain, that they may live." In Zephaniah God exults with loud singing (what kind of breath would that take?!). The death of Jesus, his very last breath, is reported by the Synoptic Gospels as a loud cry. And finally, there is the rushing, violent wind of the Day of Pentecost, the birth of the church itself. 2) Beauty: real organs are built by skilled craftsmen who have different areas of specialty and spend decades learning and perfecting their craft. A working organ shop is a thing to behold. This is the kind of beauty that we seek to bring into our worship in everything we do: architecture, vestments, liturgy, ceremonial, words, music, preaching. We strive to bring our best to everything in our worship. Electronic organs can only emulate and imitate. They have nothing of their own to contribute and are not truly beautiful. And lighted stop knobs are hideously tacky. 3) Integrity: this almost goes without saying, but electronic organs aren't real. They're simply attempting to copy the sounds that a real organ would make. And don't get me wrong, the technology has come a long way since 1939. The results are more and more impressive, but no matter how good they get they will never actually be real. And unlike Pinocchio, there is no magical transformation that awaits them. What is it that prevents electronic organs from being real? The first time I came home from college I noticed the electronic instrument I knew in high school sounded completely different to me: it was flat, fake. But the tone quality these machines produce is better and better all the time. The systems are programmed to simulate a certain "out of tune-ness" and subtle variations in pipe speech that real organs have. They try to emulate the huff and puff of the whole winding system of a real organ. (Cameron Carpenter is so impressed with all of this he has jumped in with both feet.) Surely the ability to generate and replicate pipe sounds electronically will continue to improve even more. So what is it that keeps them from being real? Well, it has to be what's moving the air that makes the sound. 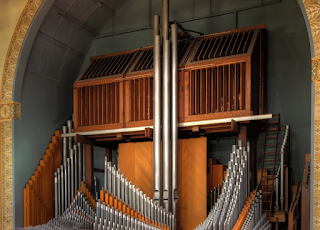 In the case of the Pipe Organ, the sounds that seem to be coming from pipes are made by pipes. In the case of the Electronic Organ Simulator, the sounds that seem to be coming from pipes are made by speakers. There's just something fundamentally dishonest about this. Even if you had a big enough budget to get a really obscene number of speakers for this installation (let's say you go so far as to have one speaker for every "pipe" in the organ simulator), you still have the fundamental problem of integrity. You are trying to make something sound like pipes that are not pipes. Do Electronic Organ Simulators have their place? Sure! How about your spare bedroom, or your basement! It's great fun to have one of these things and to simulate the sounds from lots of different organs around the world. But let's call it what it is, a simulator, and not hold it up as a paragon of excellence. Kerala Snyder has a marvelous book about the development of the North European organ called The Organ as a Mirror of Our Time. Can we look at the instrument on the cover of The American Organist as a mirror of our time? What would it tell us if we did? The first Allen Organ was made in the Industrial Age; the latest Allen Organ to roll off the assembly line is a product of the Information Age. Our knowledge-obsessed society prizes high-tech achievements over craftsmanship. No longer concerned with wind, beauty, or integrity, or even with how well-built an organ is, many are content to gaze upon the latest technological achievements in the Organ Simulator and admire how impressively it manages so much Information. But the Information Age is still brand new. We are still discovering what it means to live in such a time as this. The new Information Economy can give rise to the promise of the Information Superhighway one day and the Junkyard of Fake News the next. When we hold up this organ as a mirror of our own time we first notice it's not even a pipe organ at all. It's a pale imitation of the real pipe organ at best. But many are content to pretend that it's just as good as the real thing. And if you repeat this lie long enough, doesn't it start to seem true? The electronic organ is fake news. The organ truly is a mad idea. An audacious one. Mozart famously dubbed it "the King of Instruments." And occupying the instrument to make it live is a shared desire among organists that I know. When we disagree about the philosophy behind instruments it's due to this: our differing ideas about how to "live inside" the instrument and to make the organ and it's repertoire come alive. So where would you rather live? To borrow the terminology of a great science fiction movie of the Information Age: would you rather live inside the matrix (a simulated reality) or live in the real world? "What is truth?" asks Pilate. Will we take the red pill or the blue pill? I'm going to reach for the red. Today is the Feast of Athanasius, Bishop of Alexandria, 373. O Lord, who established your servant Athanasius, through wisdom, in your truth: Grant that we, perceiving the humanity and divinity of your Son Jesus Christ, may follow in his footsteps and ascend the way to eternal life, who lives and reigns with you and the Holy Spirit, one God, now and for ever. Amen. In the episode I heard, Roy Blount Jr. tries it with the opening of Genesis. And the idea is pretty funny. Tangent: As I write this, I realize now that Roy Blount Jr. is probably not related to Roy Blunt, the Republican US Senator from Missouri. Try it with the First Lesson for this coming Sunday, and you get a very different outlook on the early church. Those who had been baptized devoted themselves to the apostles' teaching and fellowship, to the breaking of bread and the prayers. And then the murders began.